William (Wm.) 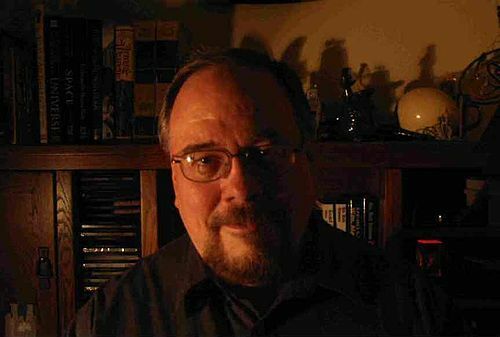 Mark Simmons was born in 1953 and spent his formative years in Independence, Missouri, the hometown of President Harry S. Truman and fantasy author Jim Butcher. He has had a varied career as an award-winning journalist, broadcaster, musician, and entertainer. Before he turned his attention to Science Fiction, (William) Mark Simmons was winning awards for his writing, first as a newspaper journalist and later as a broadcast copywriter. Mark currently resides in the town of Hutchinson, Kansas, not far from the world famous Cosmosphere Space Museum. Before retirement, he was the Music Director for Radio Kansas and could be heard as the network’s morning Classical host throughout nearly half of the Sunflower State. He is a member of SFWA (Science Fiction & Fantasy Writers of America). Quantum tools for quantum mechanics / cyberpunks rewired / wetware debugged / RNA reprogrammed / DNA reconditioned / temporal paradoxes recalibrated / gravity wells emptied / black holes filled / tardis detailing available upon request / tesseracts folded / chrono-synclastic infundibulums deconstructed / ringworlds rotated and balanced / magnetic poles degaussed / parallel dimensions parked / shadowships groomed / guaranteed interdimensional trans-spatial rift repair / bussard collections appraised / singularities multiplied / vulcan massage / klingon khiropracty / romulan acupuncture / ferengi feng-shu / andorian aroma-theraphy / rigelian reiki / hobbit reflexology / androids outed / cyborgs to order / telepaths trained / jihads mediated / peace processed / despots dethroned / bums rushed / dilemmas dehorned / worms recanned / mutant X-factors tripled / adamantium bio-grafting by special order / Y2K timeshares to order / computers exorcised / vampires staked / werewolves stalked / monsters pacified / demons banished / tomes translated / plots thickened / editors edified / slushpiles drained / legends launched / tales told /songs sung / hearts mended / souls recovered / spirits set free . . .